Crispy, cheesy, and packed with nutrients—what's not to love? We know it’s your year. We know you are one of the most nutritious vegetables a person can eat. We know how versatile you are—that you’re delicious roasted, mashed or made into soup, and that you can even turn into pizza crust and rice. 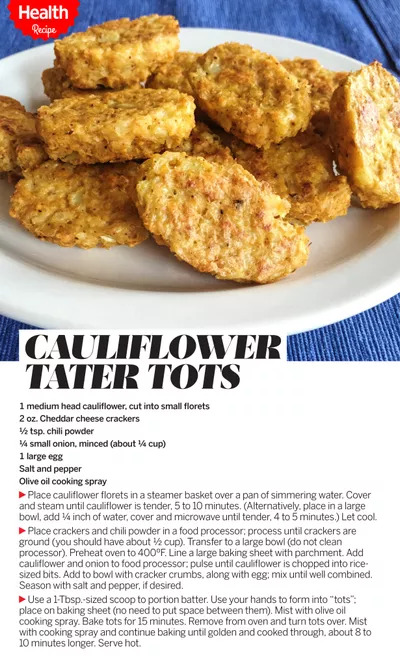 But cauliflower “tater tots”? Come on, cauliflower, now you’re just showing off. RELATED: What Beats Buffalo Wings on Game Day? Buffalo Cauliflower!